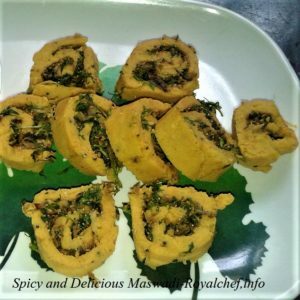 This is a easy to follow step-by-step Recipe for making at home spicy and delicious authentic Maharashtrian Style Maswadi. 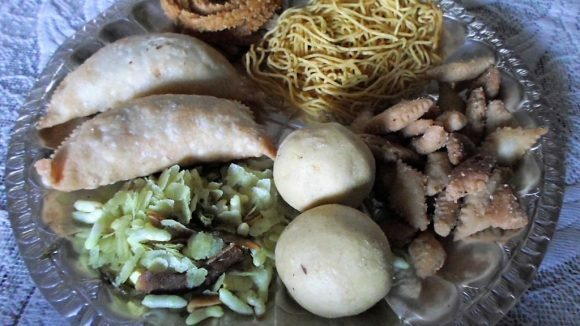 Maswadi is a traditional Maharshtrian gram flour dish, which is served as a part of the main course. Chop the Onion, Ginger-Garlic-Green Chili, shred the Dry Coconut, Wash and chop the Coriander leaves and keep it aside 5-10 minutes for drying. In a Kadai, dry roast the shredded Coconut, Sesame and Poppy Seeds and keep them aside. Heat the Oil in a Kadai and add the chopped Onion, Ginger-Garlic-Green Chili and saute for 2-3 minutes until the color changes in to light brown. Then grind the mixture into a thin paste. Take the Onion Paste, Coconut, Sesame Seeds, Poppy Seeds, Coriander-Cumin Seeds, Coriander Leaves, Red Chili Powder, Turmeric Powder, Garam Masala, Salt, Asafoetida and mix it nicely. Heat 2 cups of Water and add the Ginger paste, Red Chili Powder, Salt, Turmeric Powder, Besan and mix it well. Cook the mixture until it become a little thick. Keep it aside for 5 minutes for cooling and then spread the mixture over a plastic paper like a chapati. Then spread the stuffing mixture over the chapati and then fold the chapati like a roll and gently remove the plastic paper. Then slice the roll into 1/2” sized pieces. Garnish the Masswadi with Coriander Leaves and the serve.